All the cockpit adjustments paid off on Sunday for an afternoon ride to Southbury on Sunday. Shifting was superb, Katie loved the new saddle, the bars in the front for me were awesome, and Katie loved all the new hand positions she got with the ergons. I think the one thing I would change if there is time is a longer stem for her in the back but I am not sure I can find one in time. We used the Travel Center in Southbury as the turn around point. It was just over seven miles from home. I don't think I ever got off the bike. Katie was thirsty but I had drunk a 32 oz Powerade before we got on the bike after planting 4 fruit trees in my front yard and was not at all thirsty. On the way back I took a few pictures over the back of my head and of course Katie hammed it up appropriately. I was hoping to try and do 20 miles with Katie today but we only had time for 15. It was nice coming down this way but going home was brutal because of all the climbing. 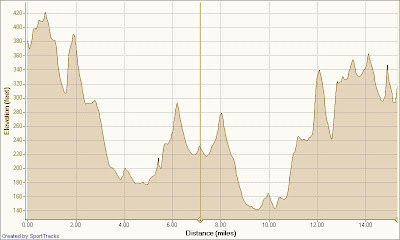 I tried to think of a better way but nothing came to mind so we retraced out path and did every climb: Wallnut Tree Hill and the two climbs on Alberts Hill and Katie insisted on riding up the hill on Bramble Trail. I will have to load the GPS data to Garmin's website to see what the climb totals were because I am not sure SportTracks calculates the climbing correctly.